The book stock held by the authors is sold out. There may be a few copies in the shops and visitor centres noted below. The normal price for this full-colour hardback is £30. A paperback version is being printed and should be available from May 2019, price £15. Details to be added here when we have them; in the meantime please contact us if you'd like to order a copy or copies. 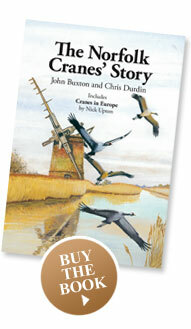 Shops and visitor centres: 'The Norfolk Cranes' Story' was originally available from a range of shops and visitor centres. It's likely that, several years on from the book's launch, many haven't kept it in stock and the list below has been thinned to the known outlets. The best bets are Jarrolds Department Store, Norwich and Norfolk Wildlife Trust centres. Sale from us or online (as below) will resume once the paperback is printed. 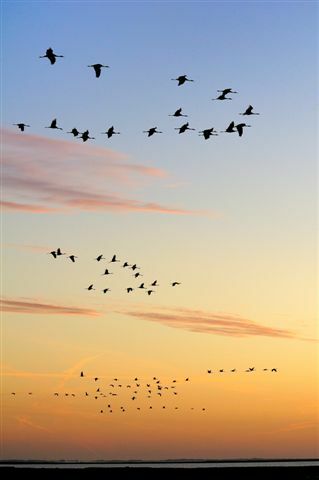 Norfolk Wildlife Trust centres at Cley and Hickling (year round), and Ranworth (seasonal, sold out). Subbuteo ceased trading in 2018. Germany: the book is available from the Crane Information Centre. USA: the book is available from Buteo Books. Much of our distribution was originally through book distributer WildSounds and though them the book may be in other nature reserve shops. Dust jackets: sometimes these tear, of course. If you have a copy and need a replacement jacket, we can supply one free of charge. Contact Chris, please. These words of encouragement were in a letter to John Buxton in May 2002 from George Archibald, who founded the International Crane Foundation in Baraboo, Wisconsin and was its Director until he retired. 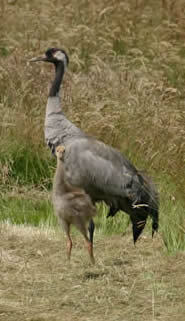 Nearly a decade after that encouragement, The Norfolk Cranes’ Story has been published.